We need to have reasons to celebrate – a birthday, a marriage, a new baby, a retirement, an anniversary. Giving homage to our milestone moments makes the slog through the mundane day-to-day and those darker moments more possible. Things are better with a smile, camaraderie and a bit of cake. We are at work to work, but we spend a goodly chunk of time with our workmates and therefore it is important to bond. We bond when we share the weight of difficult tasks and we bond when we share the light of a celebratory moment. We just have to figure out what the right amount of time and effort to apply to sharing these moments – both good and bad – and this right amount is different at each office or work place. What outward evidence is permissible? Decorations set the mood and can bring a smile to everyone even as people work away. But where is the line for over the top? 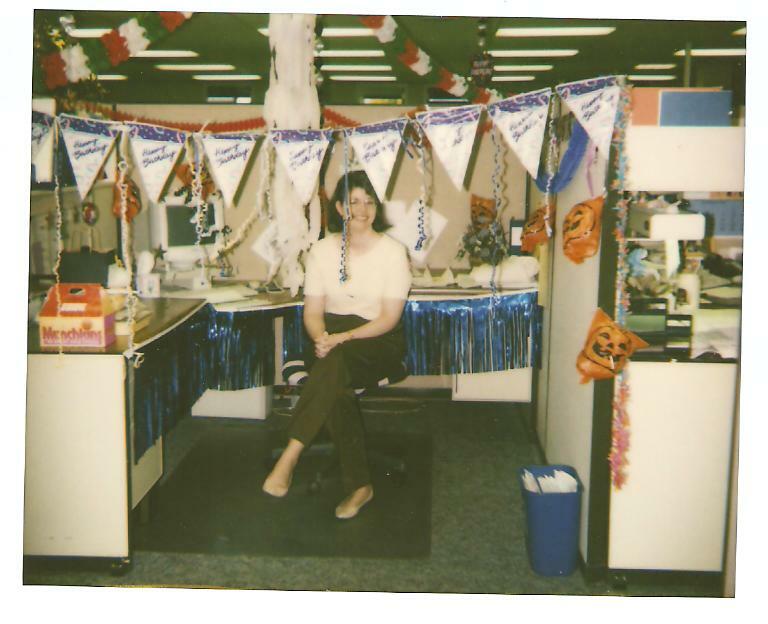 I think we have all seen cubicles that wind up looking like a whole party store was crammed in. Tasteful would be a good line, but it means wildly different things to different people. Most cube walls could do with a bit of holiday or personal celebration type décor now and again. Joyfulness creates energy, which can power a team to be productive with a smile. At least until the sugar high from the cake wears off. Then it’s time to get more goodies. Oh, by the way, this topic was on my mind because today is my birthday. If you are looking for me, I’ll be the one with the tiara – while I have decided to stop aging, I do like to celebrate the anniversary of my birth. What level of gaiety is allowed at your work place? Happy Birthday! Thanks for raising such interesting questions. Last year, one woman in our office wrapped her office door like a large Christmas present. She hopes others will join her this year. As for other personal expression, my office is decorated with photographs that I took or my daughter took. Some are framed 8×10’s and a couple are Canvas on Demand fabric prints. And then there’s my coffee table. I think it’s tasteful, but I might be getting close to the edge. Thanks Dan! I like the idea of the photos that tell their own story, but also give you a reminder of your daughter. I hope your office mate gets others to join her – it sounds festive! We are a bit more modest at my workplace. Once a month we gather for cake with that month’s birthday celebrants and each are presented with a card signed by everyone. On the day of I go to the birthday person’s computer and change their background image to a Happy Birthday and I change the screen saver to a scroll that says Happy Birthday. Thanks – a little reminder that it is a special day on the person’s computer strikes a nice note. It should bring a smile.